Pierre-Auguste Renoir (1841–1919), Danseuse (The Dancer) (1874), oil on canvas, 142.5 x 94.5 cm, The National Gallery of Art, Washington, DC. Wikimedia Commons. 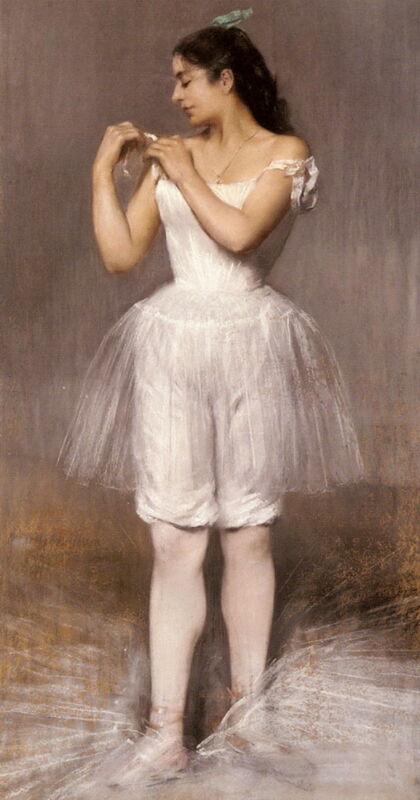 Prior to the late nineteenth century, many paintings had featured dancing, but very few the ballet proper. Important and successful dancers were popular subjects for portraits, usually paid for by their patron, and the occasional dancer even modelled for figurative works. 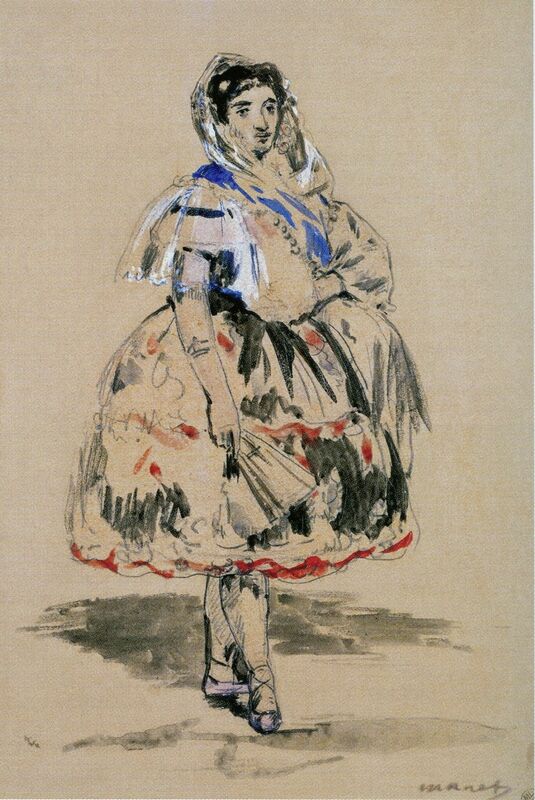 Édouard Manet (1832–1883), Lola de Valence (Aquarelle) (1862), pencil, pen and ink, watercolour and gouache, 25.6 × 17.3 cm, Musée d’Orsay, Paris. Wikimedia Commons. The impressionist tradition of painting dancers was more typically of ‘Spanish’ and more exotic varieties, and is rooted in Manet’s well-known painting of Lola de Valence (1862), seen in his watercolour study above, and the finished work below. 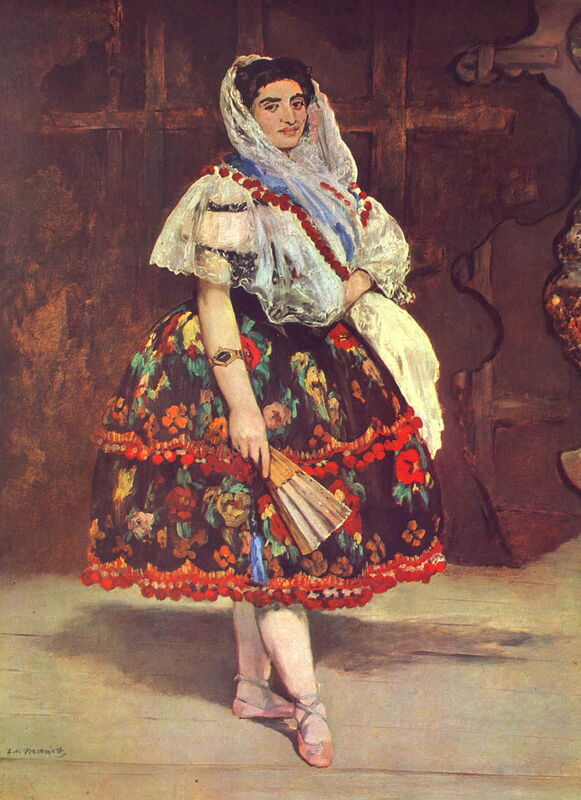 Édouard Manet (1832–1883), Lola de Valence (1862), oil on canvas, 123 × 92 cm, Musée d’Orsay, Paris. Wikimedia Commons. This was influential later, when John Singer Sargent, William Merritt Chase, and others painted Carmencita in 1890 and after. Others, like Franz von Stuck, favoured more radical expression of contemporary dance. 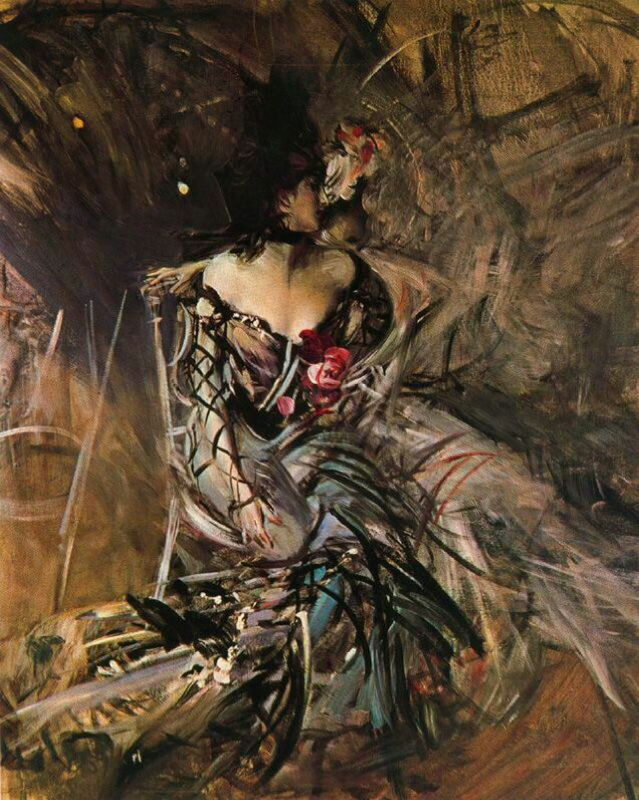 This was a natural theme for the ‘master of swish’ Giovanni Boldini, who was a good friend of Degas. Boldini painted a Portrait of Anita de la Ferie, ‘The Spanish Dancer’ (1900), above, and The Spanish Dancer of the Moulin Rouge (1905), below. 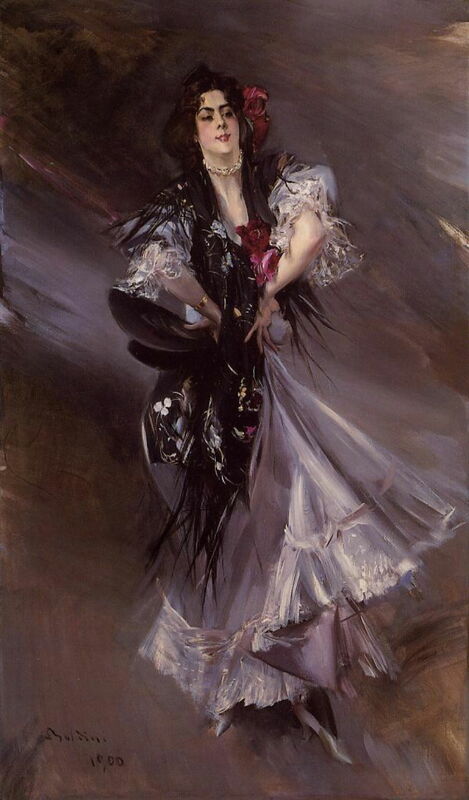 Giovanni Boldini (1842–1931), The Spanish Dancer of the Moulin Rouge (1905), oil on canvas, further details not known. Wikimedia Commons. Georges Seurat (1859–1891), Le Chahut (The Can-Can) (1889-90), oil on canvas, 170 × 141 cm, Kröller-Müller Museum, Otterlo, The Netherlands. Wikimedia Commons. 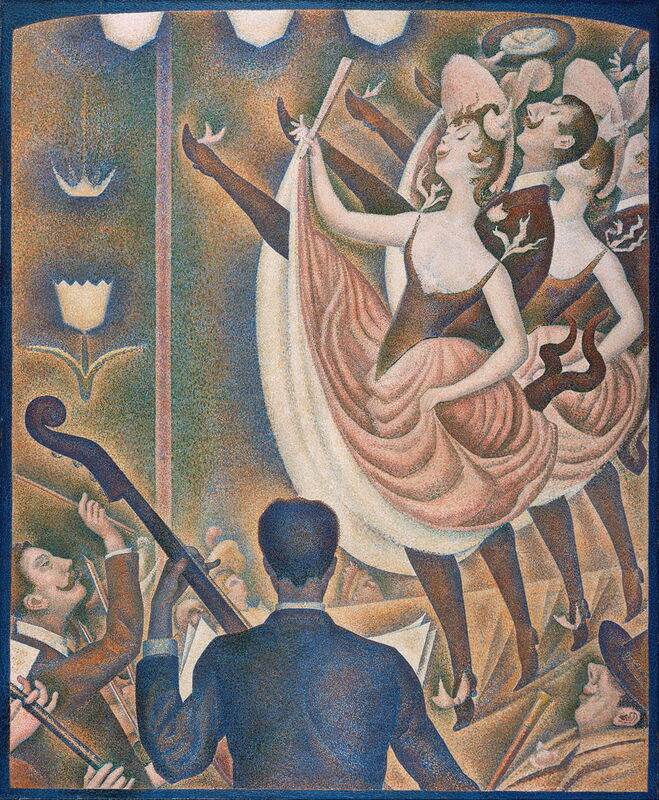 Although it may seem a paradoxical subject for the slow and painstaking Divisionist approach to painting, Georges Seurat’s Le Chahut (The Can-Can) (1889-90) was well-known. 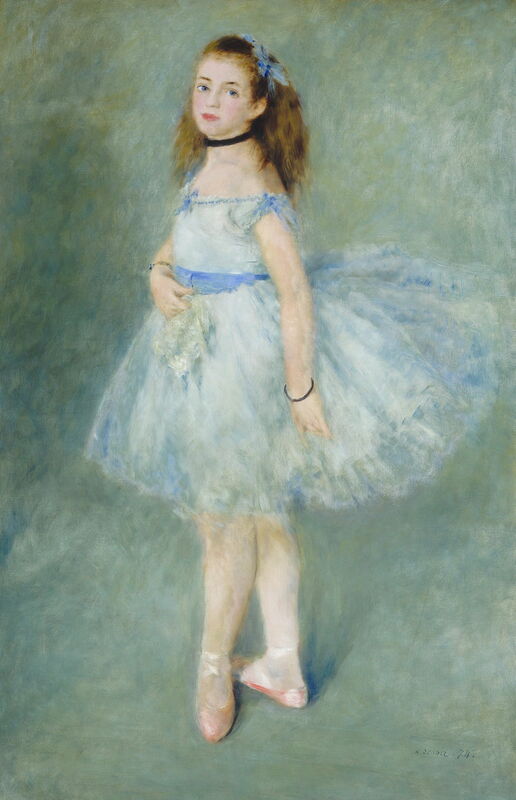 Shortly after Degas started painting dancers and scenes from the ballet, Pierre-Auguste Renoir painted his Danseuse (The Dancer) (1874), but did not pursue the theme as doggedly as Degas. 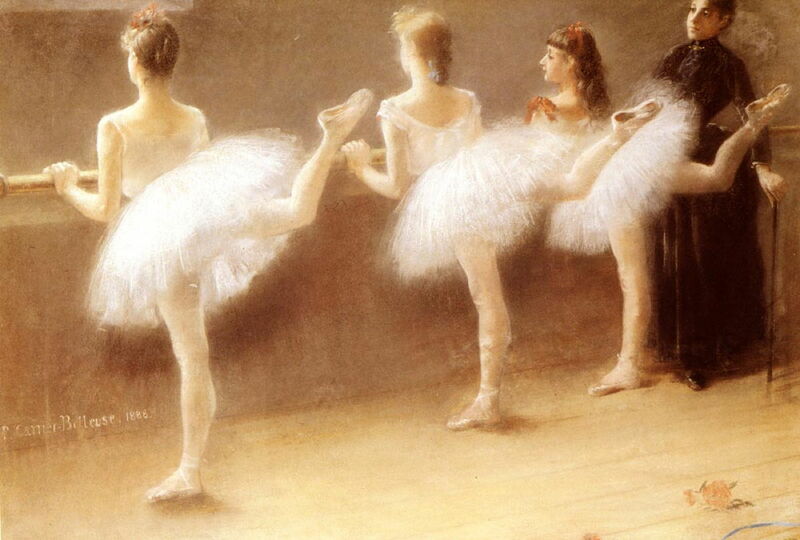 The only artist who could have come close to Degas’ obsession with the ballet was Pierre Carrier-Belleuse (1851–1932). A student at the École des Beaux-Arts in Paris as Degas was painting his first canvases of the ballet, it is quite possible that Carrier-Belleuse was influenced by Degas’ paintings. 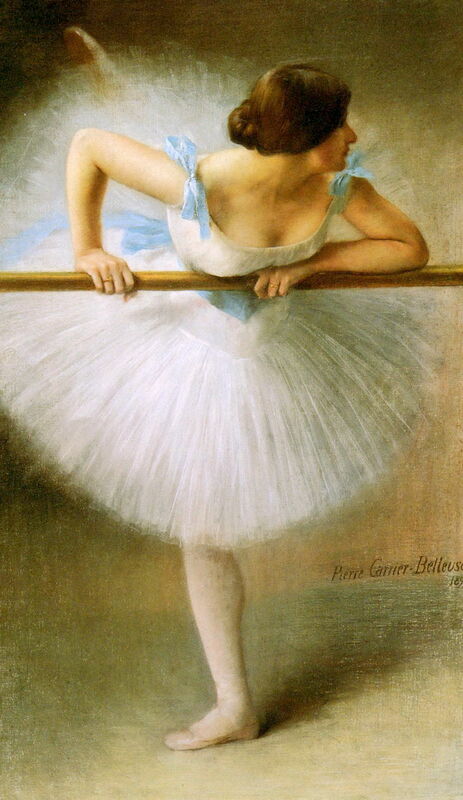 Pierre Carrier-Belleuse (1851–1932), At The Barre (1888), further details not known. Wikimedia Commons. Carrier-Belleuse was successful at the time, with a steady stream of paintings such as At The Barre (1888, above) and Before the Ballet (1896, below). Pierre Carrier-Belleuse (1851–1932), Before the Ballet (1896), further details not known. Wikimedia Commons. Pierre Carrier-Belleuse (1851–1932), La Danseuse (1897), further details not known. Wikimedia Commons. Paintings such as La Danseuse (1897, above) and Danseuse (1898, below) clearly revelled in, perhaps exploited, the lithe figures of their subjects, but remained on the right side of good taste. Pierre Carrier-Belleuse (1851–1932), Danseuse (1898), further details not known. Wikimedia Commons. Pierre Carrier-Belleuse (1851–1932), The Ballerina (1899), further details not known. Wikimedia Commons. 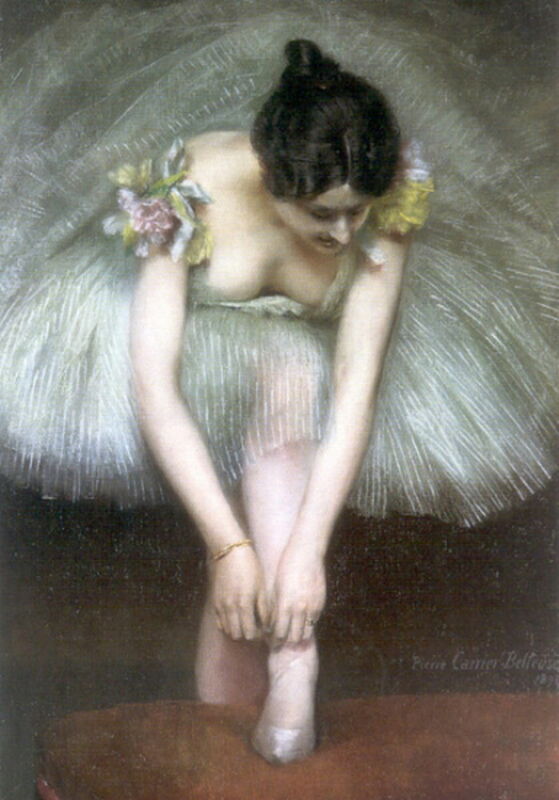 Carrier-Belleuse’s other paintings included more risqué nudes, and sometimes those of dancers strayed a little in their intent, as in The Ballerina (1899), above. 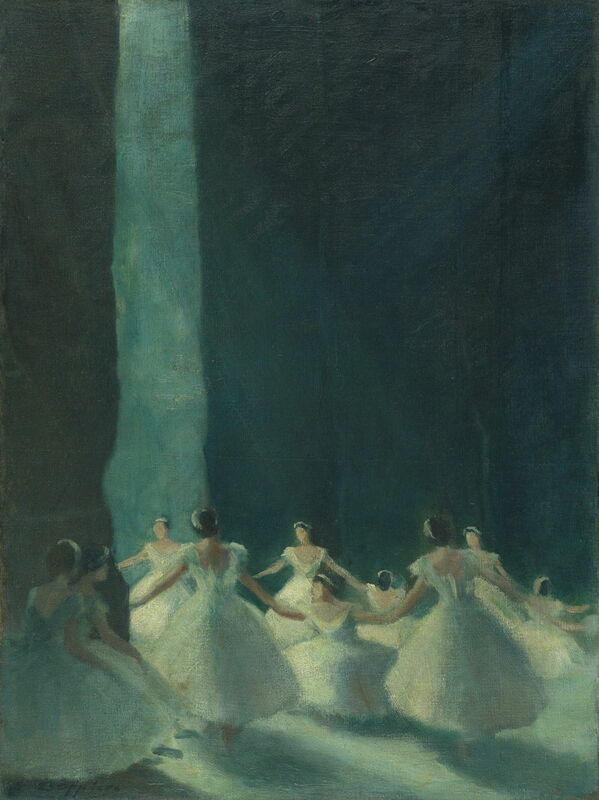 Other later paintings kept more on track, as in The Ballet Lesson (1914), below. 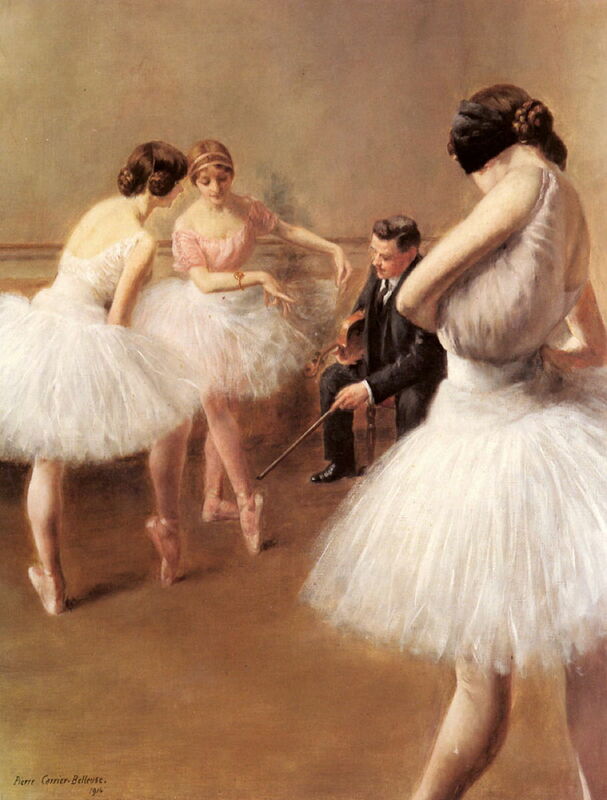 Pierre Carrier-Belleuse (1851–1932), The Ballet Lesson (1914), further details not known. Wikimedia Commons. 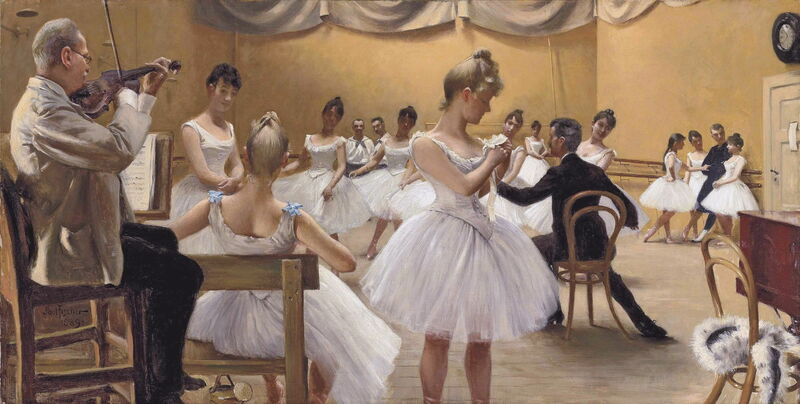 Paul Gustav Fischer (1860–1934), The Royal Theatre Ballet School, Copenhagen (1889), oil on canvas, 53 × 102.9 cm, location not known. Wikimedia Commons. 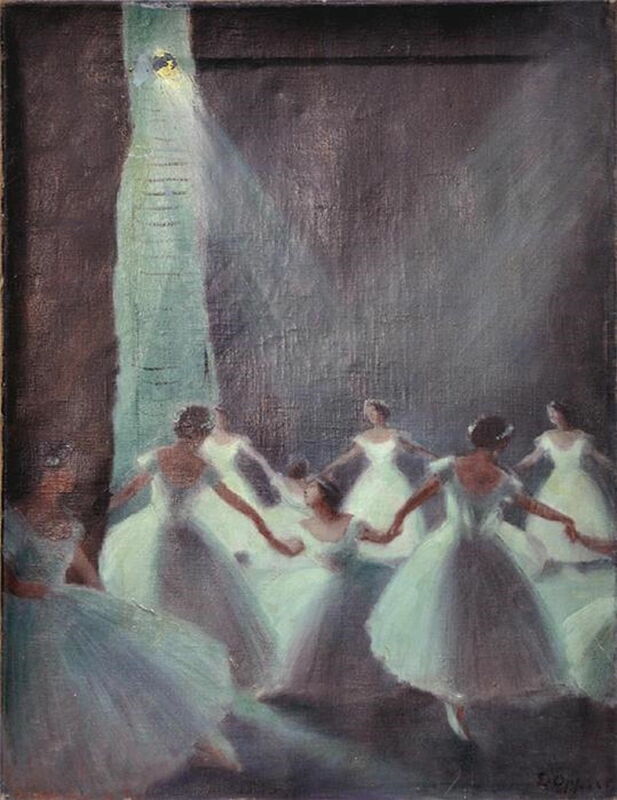 Some other artists attempted more serious paintings of the ballet. Paul Gustav Fischer’s immaculately documentary depiction of a scene from The Royal Theatre Ballet School, Copenhagen (1889) shows its violinist (Busch), the leading dancer Charlotte Weihe (centre), and the school’s ballet master, Emil Hansen (seated). 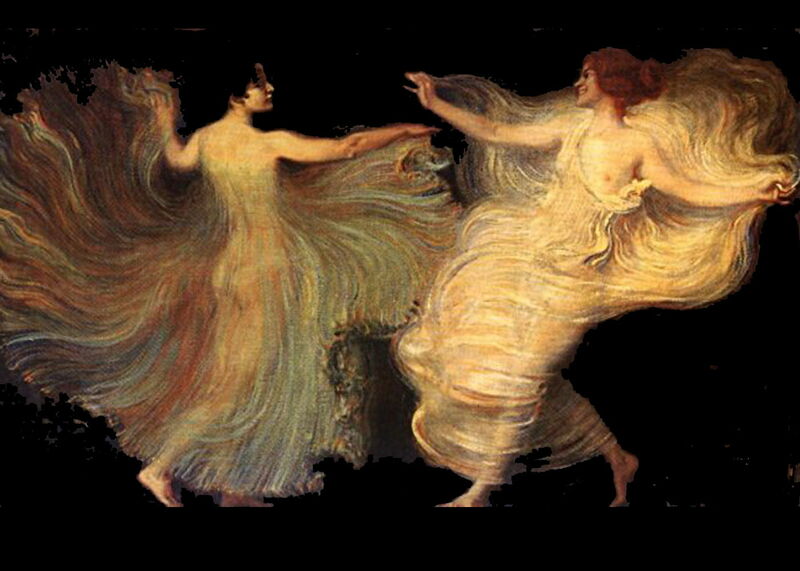 Ernst Oppler (1867–1929), Les Sylphides (1915), media not known, 60 x 45 cm, location not known. Wikimedia Commons. Ernst Oppler, a German Impressionist and contemporary of Lovis Corinth, painted a couple of similar views in the wings of Les Sylphides (1915), above, and Ballet Scene (1915), below. He also made some prints of dancers. Ernst Oppler (1867–1929), Ballet Scene (1915), further details not known. Wikimedia Commons. Rudolf Kremlička (1886-1932), Dancer (1918), oil on canvas, further details not known. Image by Ablakok, via Wikimedia Commons. The Czech artist Rudolf Kremlička appears to have been influenced more generally by Degas and his favourite motifs. His Dancer (1918) is reminiscent of the young girls painted by Degas, and Kremlička painted several works showing women bathing and at their toilet, although in much more modern style, more similar to some of the nudes by Matisse. 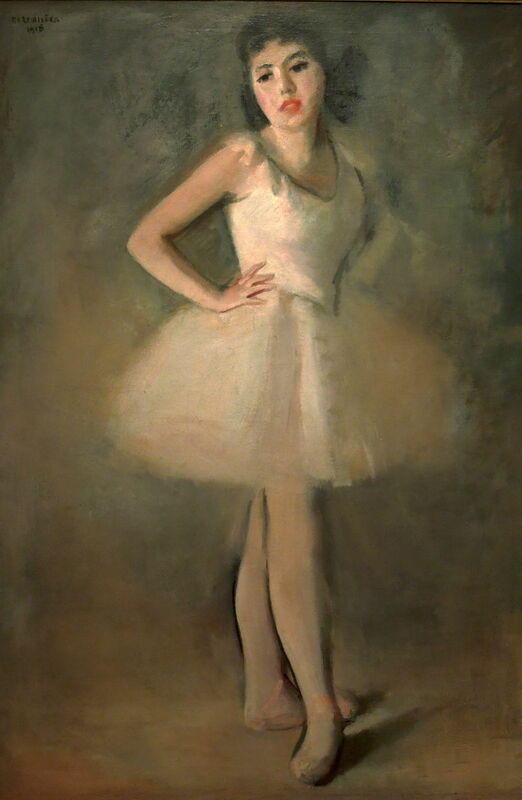 The next article will look at paintings of the more sinister side of the ballet in the days of Degas: the relationships between young dancers and older men. Posted in General, Life, Painting and tagged ballet, Boldini, Carrier-Belleuse, dancer, Degas, Fischer, Kremlička, Manet, Oppler, painting, Renoir, Seurat, von Stuck. Bookmark the permalink.